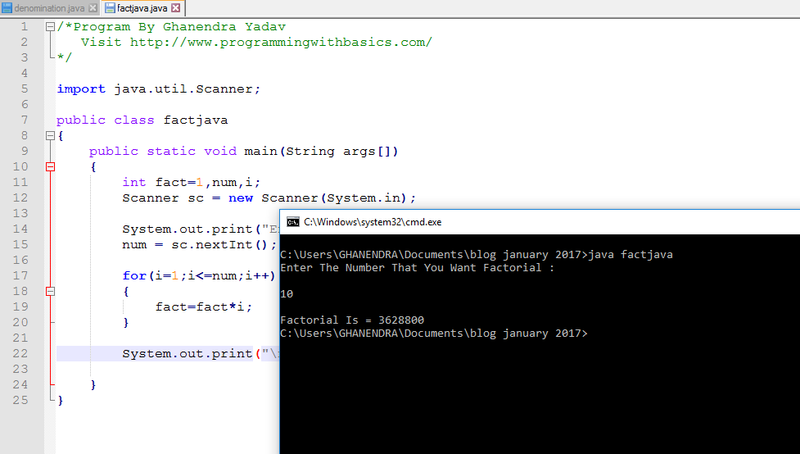 Problem:- Factorial Program in Java or Java program to find factorial or Java Program to Find Factorial of Number or Java Program to Find Factorial Value Without Using Recursion or Java Program to Find Factorial or Write java code to calculate factorial of any given number or Finding Factorial of a Number in Java or Factorial Program In Java Using While Loop or Factorial Program In Java Using for Loop or Java Program To Calculate Factorial using standard values with outputs or Write a Java Program To Calculate Factorial Of A Given Number. What Is Factorial:- In mathematics, the factorial of a non-negative integer n, denoted by n! is the product of all positive integers less than or equal to n.
5! = 5 * 4 * 3 * 2 * 1 = 120. The value of 0! is 1, according to the convention for an empty product * The factorial operation is encountered in many areas of mathematics, notably in combinatorics, algebra, and mathematical analysis. Its most basic occurrence is the fact that there are n! ways to arrange n distinct objects into a sequence (i.e., permutations of the set of objects). This fact was known at least as early as the 12th century, to Indian scholars.